Gain exposure for your website. Your website’s visibility increases and its prominence is enhanced when it’s listed in a specific category along with related top-quality sites. Make your website a quality resource for information. The Highlight HEALTH Web Directory is human-edited and spam free. Each and every submission, free or paid, is evaluated for content and quality prior to directory inclusion. The directory listing is free. All regular listings with a link back to the directory are free cost only $5.00. Receive an incoming link to your website from a trusted, reputable source. The Highlight HEALTH Web Directory complies with the HONcode standard for trustworthy health information. The mission of the Highlight HEALTH Web Directory is to compile a select, quality database of online health resources that is free for everyone to use. Every day, two random links and their descriptions from the directory are featured on the homepage. Who doesn’t want more visitors? A link to your site from the Highlight HEALTH Web Directory can help with traffic. Importantly, it’s targeted traffic, meaning the reader is already interested in what you’re writing about when they click on your link. Improve your website’s search engine rankings. The Highlight HEALTH Web Directory offers regular and featured listings that don’t require a reciprocal link. These one-way links are beneficial from a search engine optimization (SEO) aspect and are important, especially for niche sites such as health and medicine. Search engines give importance to the number of links pointing to your site when ranking it for position during search. The better your ranking, the higher up your website appears on the search engine results page (SERP). Get your website indexed by search engines. Search engines like Google, Yahoo! and MSN use crawlers or spiders to search the web for new sites. If you want search engines to find your site, there couldn’t be an easier way than having them find your site through a listing in the Highlight HEALTH Web Directory. Be part of a larger community discussing health and medicine by listing your website with the Highlight HEALTH Web Directory. 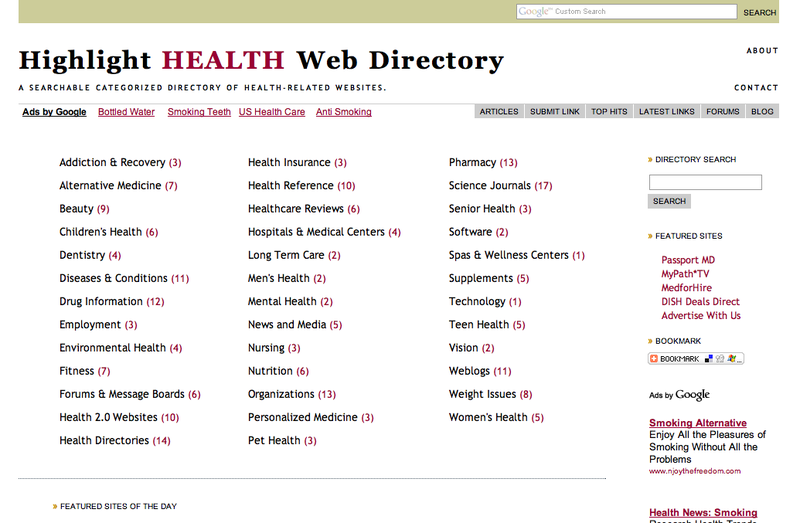 List your site in the Highlight HEALTH Web Directory today!